A Blog Named Hero Challenge – Favourite! Did you know A Blog Named Hero runs two challenge a month? The first challenge on the 10th and second is on the 20th of every month. All you need to do is use atleast one Hero Arts product for the challenge theme to make your project and link it up. You enter a chance to win some pretty awesome prizes from Simon Says Stamps. Today’s theme for the challenge is Favourite. My favourite technique is stamping. I LOVE LOVE to stamp and make my own background. This is my all time favourite because the background is unique to you and your project. That is what I have done with my card today. Here is my card for the challenge. 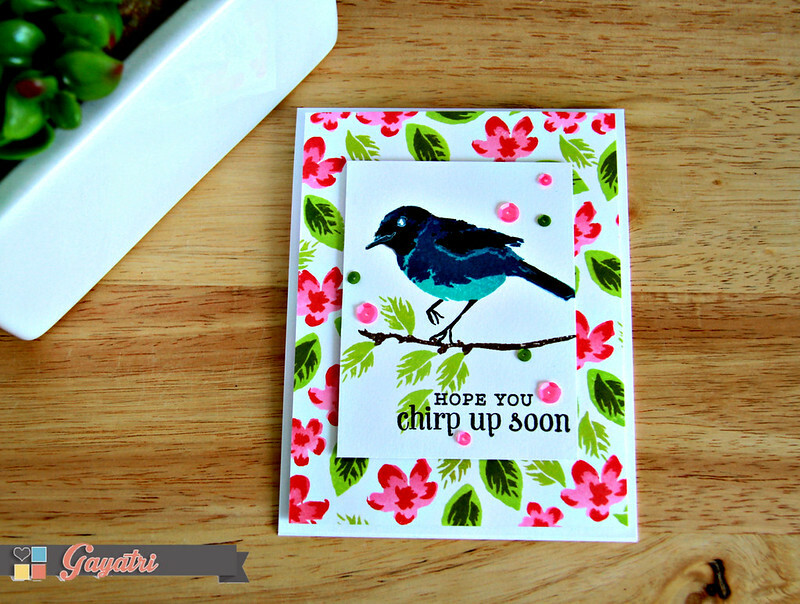 I have used the new Layered Bird stamp set only to make my card. I also wanted to show you that all you need is one stamp set to make you own background and also your focal point and sentiment. I stamped the white cardstock with the layered flowers and leaves from the stamp set. I have used Pink Ombre ink from Hero Arts for the flower base and Ruby ink also from Hero Arts for the shading. The leaves have Green Apple ink from Simon Says Stamp for the base of the leaves and Hero Arts Forvever Green for the shading. I stamped and filled the entire panel. This is my background panel. For the focal point, I trimmed the cardstock to a smaller size, then stamped the branch in Cup 0 Joe Hero Arts ink, then leaves in Green Apple ink from Simon Says Stamp. 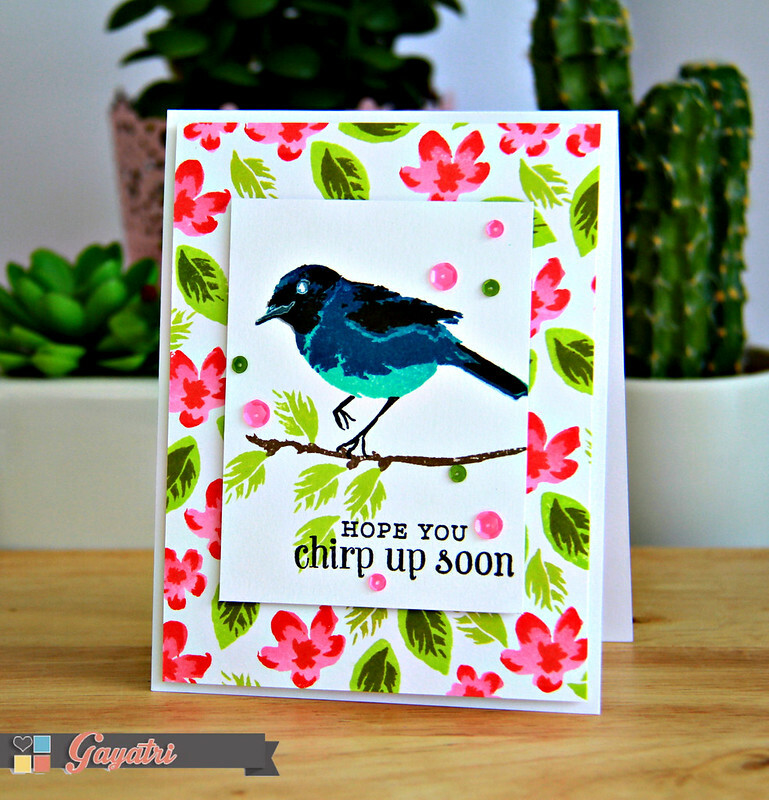 The layered bird is stamped in Blue ombre ink from Hero Arts for the base layer, then Soft Navy ink from Simon Says Stamp for the second layer, then Versafine Black ink for the third layer and the eyes and beak in Unicorn white pigment ink from Hero Arts. 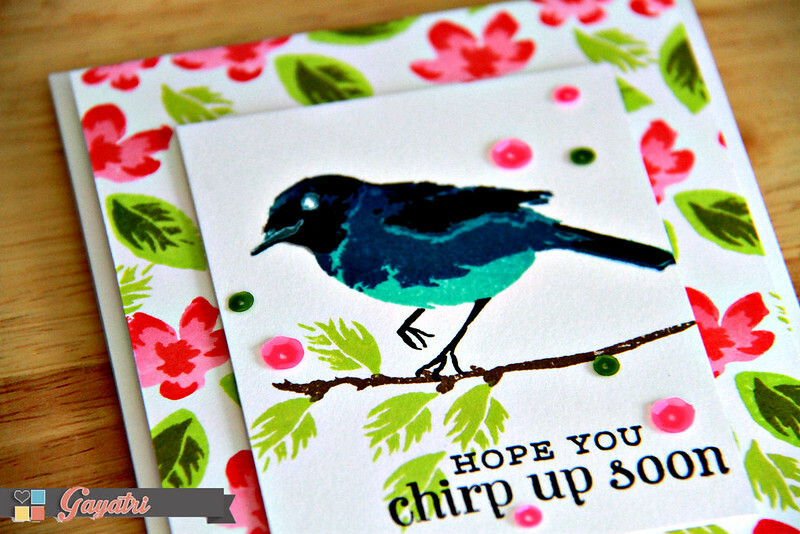 Sentiment is also from the same stamp set which is stamped in black ink. I popped up this panel using foam adhesives and accented with Pretty Pink Posh’s Mossy Green and Orchid sequins. Stamping brings so much enjoyment to me. I can stamp my heart out for many hours 🙂 Such a simple but fun technique in which you can customise your card however you want. Hope you like it as much as I do. Come and play along the challenge at A Blog Named Hero. You have until 19th of June 5pm EST to enter the challenge. stunning Gayatri. I love this bird and had fun trying out lots of colour combos.